The goal for the Koury Center project was to create a new home for Elon University’s growing business program with a design that supports the Elon’s student-focused approach to education. Spillman Farmer Architects’ challenge was to create energizing spaces that promoted the program’s mission of student engagement within a traditional shell. 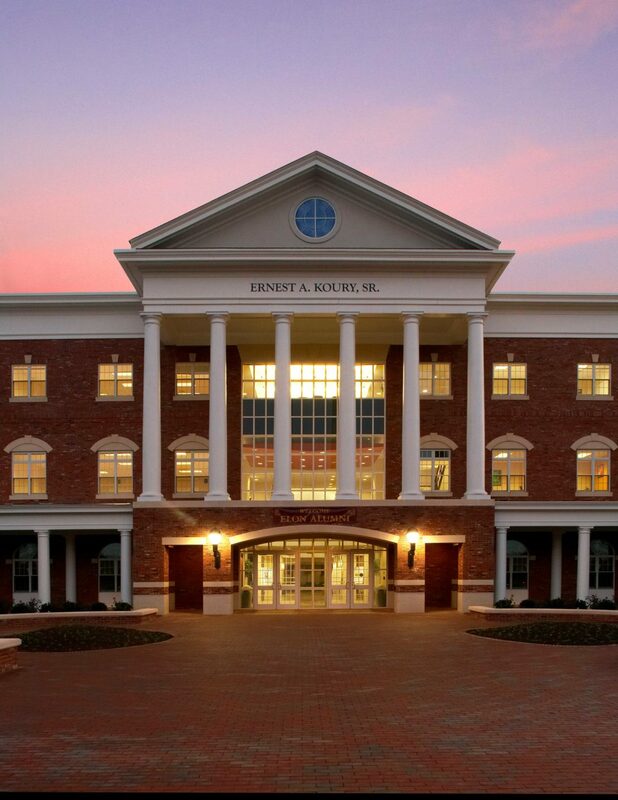 Spillman Farmer Architects has worked with Elon University since the early 1990s and has completed more than 25 successful projects on campus, including several master plans. Throughout the master planning process, Spillman Farmer Architects collaborated with the University to develop concepts for a new location for their growing new business school. As part of the master plan, Spillman Farmer explored both short- and long-term solutions, as well as options and presented sketch concepts for the eventual new building. As the University moved forward with the project, these concepts were refined through more extensive studies. The design team developed renderings and a 3D model for building conensus and fundraising purposes. The goal for this project was to create the new home for Elon University’s growing business program with a design that supports the Elon’s student-focused approach to education. Spillman Farmer Architects’ challenge was to create energizing spaces that promoted the program’s goal of “student engagement” within a traditional shell. The William Garrard Reed Finance Center simulates a real stock trading room, with plasma screens to deliver cable financial news and an electronic stock crawl that provides the latest data from global financial markets. The 240-seat LaRose Digital Theatre is fully wired for multimedia and worldwide videoconferencing technology. It includes a three-chip, high definition DLP video projector. An advanced video conferencing system includes three video cameras and 12 microphones that can stream signals through a broadband Internet connection. All 16 classrooms allow instructors to access technology from the lectern, including the Internet, real-time financial information and cable television. All classrooms have a video projector with stereo sound. Multiple classrooms offer flexible seating configurations to fit different lesson plans and accommodate group work. The Koury Business Center has 2 traditional computer labs that contain a total of 78 PC workstations, while a third collaborative lab contains seven pods, each with five networked computer workstations that can be switched to route their displays to a large-screen plasma flat panel display. The center also has 17 study rooms, 3 student research rooms, 2 club rooms, a student enterprise academy room and a seminar/board room and dean’s suite. The LabCorp Suite for Executive Education includes 3 classrooms, 4 study rooms and a specially designed collaborative computer lab for conducting realistic business simulations. The Master of Business Administration program will have dedicated quality classrooms, and MBA students taking evening classes after work will be able to use the center’s small dinner and coffee house area. One of our objectives was to design a facility that would allow student engagement – the hallmark of an Elon education – to flourish. As a dutiful committee, we decided to visit about 10 other new business school buildings, but did not see any facility where student engagement was a primary design consideration…[Spillman Farmer] was responsible for designing a unique structure that would do for student engagement what was not evident elsewhere. And boy, did they succeed. There is no other business school building that rivals what we have here, not in the United States, or the world.